Wow……A super lux place to stay with a conscience! If you're looking for some swish accommodation made from eco-friendly materials overlooking one of Australia's top 100 beaches, then this is where you should be. Perlubie Landing is simply spectacular, a hidden gem & one that needs to be shared. 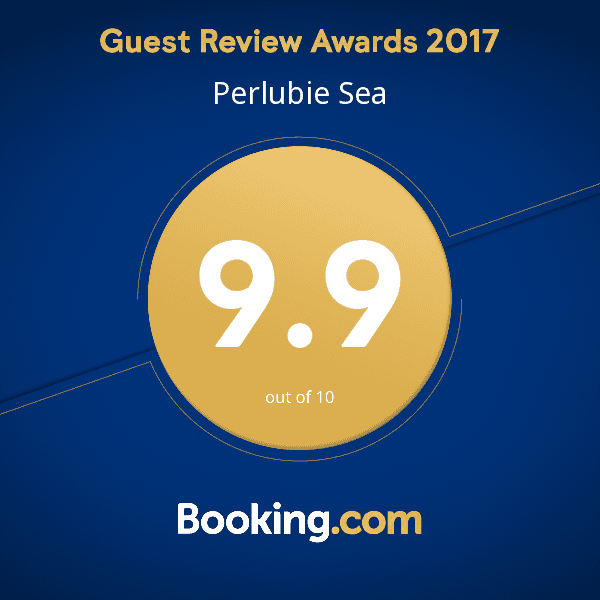 Perlubie Sea is part of a complete lifestyle change for the owners, who wanted to return to a more simple way of living and share that experience with others. Both Villas, Black & White provide you with the opportunity to escape from the daily grind, chill and just enjoy the simple but stunning things in life. The Perfect Place to Chill! Villa Black & Villa White have been purpose built to take advantage of the spectacular views of Perlubie Beach and nearby Eba Island. 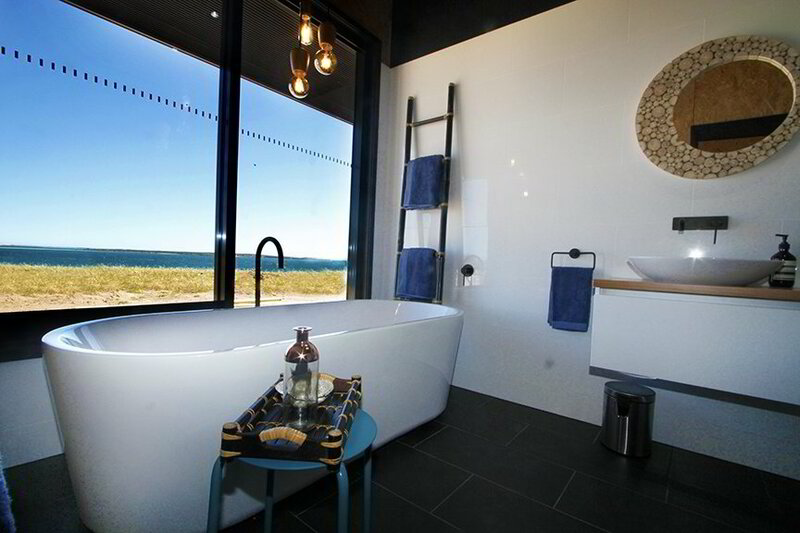 Their open plan layout and spacious interior means you can enjoy the view of the coastline from the comfort of all the living areas and even whilst soaking in that very deep tub….beer or bubbles in hand! You are only a short walk or drive to the fabulous beach, where you can swim, fish or enjoy the traditional Aussie BBQ or maybe a slightly more romantic picnic…whatever takes your fancy. Perlubie Beach is bordered by stunning white sand dunes & its wide beach provides plenty of space for walks or 4WD access. Perlubie Sea welcomes pets as long as they are well behaved. Pets are allowed in the villas as long as they do not get on the furniture or bedding. When outside the villa they need to be under your control, so they don't upset other guests or the wildlife! The villas are architecturally designed passive buildings with the walls & roof made from the highly energy efficient, structurally insulated panel system (SIPS) and all doors & windows are double glazed e glass. The design maximises the unrestricted views over the Southern Ocean whilst ensuring the most energy efficient orientation. The villas are painted white to maximise heat reflection and bamboo floors, no VOC paint & upcycled furniture continues the natural low impact theme. Underfloor heating, large fans and windows that maximise the benefit of the sea breezes ensures temperatures are always comfortable. And you can always use your air conditioner if you want to really cool things down. Both villas are less than 100 meters from the water overlooking Eba Island and the white sand dunes framing Perlubie beach. Each villa is individually decorated providing eclectic elegance with a touch of the 60's & 70's style. There is a strong focus on using natural, recycled & local products. Bed linen & towels are bamboo, toiletries organic & Australian, & all food products are sourced locally (if quality available) & preferably organic. 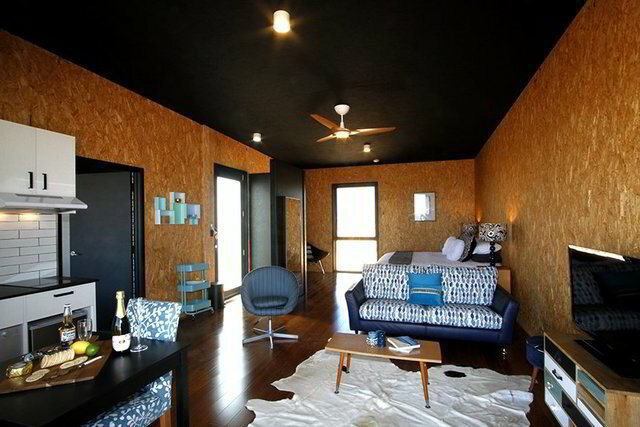 Perlubie Landing is located on the west coast of the very pristine and spectacular coastline of South Australia known as the Eyre Peninsula, about 700 kilometres west of the capital city of Adelaide. It is conveniently located 90 kilometres from the Ceduna Airport and 19 kilometres from the beautiful township of Streaky Bay. If you fly into Ceduna transport to Perlubie Sea can be arranged or you may want to hire a car to tour Eyre Peninsula. If driving it is 300 meters off the Flinders Highway/B100. Turn off the Flinders Highway at the Perlubie Landing sign onto Woolamai Way & then first left onto Wharff Drive. Perlubie Sea is signposted on the right 100m from the corner.